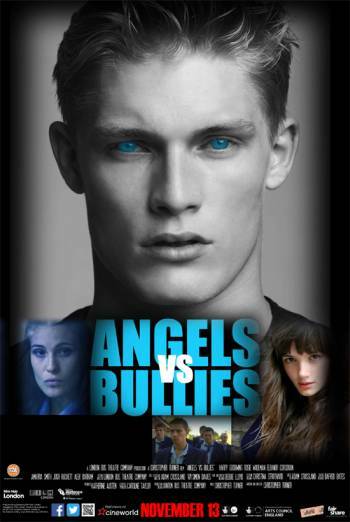 ANGELS VS BULLIES is a British drama set within a secondary school. A teenage boy is able to see and hear ghosts. The ghost of a dead schoolgirl informs him that a female pupil who is being bullied will commit suicide if doesn't intervene. The infrequent moderate violence occurs in a scene in which a female character hits a teenage boy across the head with a fire extinguisher. He is left with a bloody abrasion by the side of his left temple. In another scene it is implied that a boy with blood on his face has been bullied and made to hand over money. Other issues include the repeated sight of nonthreatening ghosts of dead schoolchildren and undetailed references to people having committed suicide after being bullied. However, the only visual representation of such a suicide is a fantasy / dream sequence in which a teenage girl jumps from a roof. The impact is not witnessed and no blood or injury is seen.